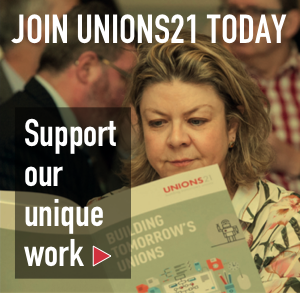 Unions 21 exists to support unions to increase their influence, impact and effectiveness within the world of work. We do this by working with unions, supporters and stakeholders to create an open space for research, innovation and activity to assist unions to secure a better life for working people. Our work is centred around three themes of work: New workers, new economies; Good work; Innovation and change.